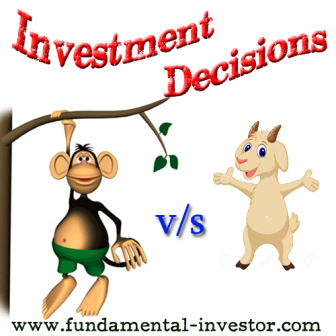 Fundamental Investor: Share Bazaar of Monkeys and Goats !!! How are you doing? Before you read further, please click here to read "Monkey Story of Stock Market Dynamics"
We are all learning in this wonderful market. Valuation of a company is an arduous task by itself. There are multiple things to be taken into consideration before you can put a price on a company's share. But, differentiating a good company from a junk one is fairly easy. We sometimes falter in this basic decision and end up losing nights of sleep. Apart from the story which I shared previously, I read one more story which gives us a lot of insight on how to make investment decisions. After all, we are putting our hard earned money into something which should give us decent returns forever. Long ago, in a village a man appeared and said that he wanted to buy monkeys. He said that he would pay Rs 100 per monkey. The villagers caught all the monkeys in the nearby forest and village and sold them to him for a hundred rupees each. Soon another man appeared and said that he would pay Rs 200 for each monkey. But there weren't any more monkeys around. They were all owned by the first man. So the villagers went to him and said that they were willing to take the monkeys back and return his money. But the monkey owner was unwilling to sell. The villagers raised the offer price to Rs 150 per monkey, then Rs 175 and finally to Rs 199 but the man just didn't want to sell, even though he clearly didn't have any use for the monkeys. Eventually, just to see whether he would sell, they offered him Rs 200 but he still refused. The villagers were puzzled by this. Finally, one of them figured out that there must be someone else who was going to come to the village and offer even more money for the monkeys. Convinced that this was the real explanation, they went and offered the man Rs 300 for each monkey and sure enough the man accepted. Joyous at having landed such a good deal, they quickly paid him off before he changed his mind and took possession of the monkeys. The man went away with his money and lived happily ever after. The villagers waited for the next buyer. And waited… And waited... But no one ever appeared who wanted to buy a monkey. But wait.... If you think you've guessed the moral of the story, you are wrong because the story isn't over yet. There was another village nearby. In this village a man appeared one day and offered Rs 1000 each for a goat. Now goats were valuable, but not as much as a thousand rupees so the villagers sold the goats to this man. A similar thing happened here too. A second man appeared, offered Rs 2000 for each goat. The villagers tried to buy the goats back from the first man but the first man refused and eventually the villagers ended up buying the goats back for Rs 3000 each. Here too, the two men disappeared and no one ever came and offered so much money for a goat again. Goats weren't monkeys. They were easier to look after, cheaper to maintain, could be milked every day and the milk was good and healthy. Even the goat droppings could be used as fuel. The goat's hair could also be sold. When the goats eventually grew too old to be milked or died, the villagers could use their skin as leather or eat their meat. All in all, it wasn't a complete disaster. But the monkey-owners were not so lucky. They could not be kept in the house for long. The monkeys ate too much, shouted and shrieked all day and sometimes bit people. They could not be controlled and they destroyed most of the stuff in the village. They were a nuisance to the villagers. And that's the Moral of the Story. We might not get the optimum price, but buying solid performing companies is like buying a goat which gives us long term returns. Buying some companies which have a tainted past and weak fundamentals is like buying a monkey and it is a worthless bet, whatever the price. Many times, due to greed, we end up buying some penny stocks or some recommended stocks without really gauging the worth of the company. Let's be wise in choosing the right companies. They will give us steady returns in longer term.